Our Home Wind Turbine contact form will connect you with the home wind turbine dealer for your area. There are still areas open for new dealers to become the local source for wind/solar systems. So, if you are interested in becoming a home wind turbine dealer fill out the Contact Form at – WindEnergy7.com – and we can see if your area may still be open for you to become the home wind turbine dealer for your county. Residential Home Wind Turbines? Home wind turbines are our specialty. Buy a home wind turbine kit from our site. Fill out our contact form and I can connect you with the home wind turbine dealer for your area. There are still areas open for new dealers to become the local source for wind/solar systems. So, if you are interested in becoming a home wind turbine dealer fill out the Contact Form at – WindEnergy7.com – and we can see if your area may still be open for you to become the home wind turbine dealer for your county. This recent install with 5 RoofMills mounted on a pole barn and feeding power right into the grid. The WindEnergy7 systems use all the green electricity in a residence and what is left is sold to the utility company with our automatic grid-tie system. To see more videos of our home wind turbines, go to – WindEnergy7.com – and you can find info about buying a system, installer, or dealer of our home wind turbine systems. 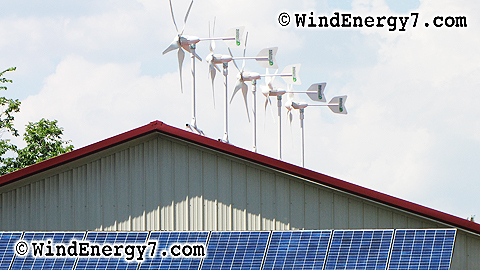 These systems pictured is the RoofMill™, and exclusive invention of WindEnergy7 that is not available anywhere else. The RoofMill™ simply mounts to the roof of almost any structure. Certified to 130mph wind, this durable, quiet system will reduce or eliminate your home electric bill. These are 4th of July Pictures from our latest installation. What you are looking at is the RoofMill™ HO 7kW Home Wind Farm Kit. This is the RoofMill™ HO 7kW, the largest residential roof mounted hybrid home system recently installed for a homeowner in Ohio. But not for long. In Texas starting next week, we are installing a RoofMill™ HO 13kW system with almost twice the capacity as this system. These 5 turbines work day and night to bring energy to the residence. On the south wall of the pole barn we mounted a 10 panel solar awning. Soon this hybrid wind/solar system will be charging a Nissan Leaf, electric car for daily driving. 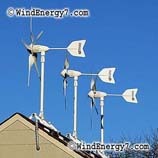 These Home Wind Generator products Only Available From WindEnergy7.com. The home wind power systems featured on this video are exclusive technology, WindEnergy7 has invented many of the best features in these Home Wind Generator systems making home wind generators work. 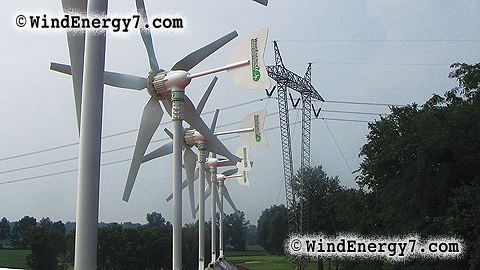 There’s a reason why these systems are so successful and effective, it’s mainly the ideas and innovations developed by WindEnergy7. The first system pictured here it the TowerMill™, which is a product designed and manufactured by WindEnergy7, it is the best price/performance system available for a home wind generator. If you have the space and appropriate site for a TowerMill™ system, it is the best system you can buy. Talk to WindEnergy7 before you buy anything else to find out why this TowerMill™ is such a superior product to anything else out there. These systems pictured is the RoofMill™, and exclusive invention of WindEnergy7 that is not available anywhere else. The RoofMill™ is the best green energy solution for urban and suburban installation. It simply mounts to the roof of almost any structure. Certified to 130mph wind, this durable, quiet system will reduce or eliminate your home electric bill. Only available from WindEnergy7-Com or one of their local dealers, the systems are shipped straight to your home. For more information, or to become a customer, dealer, or installer, go to the site at WindEnergy7.com and fill out their Contact form to find out about becoming a wind turbine customer, installer, or wind turbine dealer. 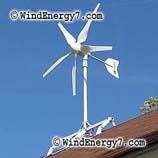 These Home Wind Power products Only Available From WindEnergy7.com. The home wind power systems featured on this video are exclusive technology, WindEnergy7 has invented many of the best features in these systems making home wind power work. There’s a reason why these systems are so successful and effective, it’s mainly the ideas and innovations developed by WindEnergy7. RoofMill™, is the invention of WindEnergy7 LLC founder, speaking in the video. This patent pending invention released last year has won the Think Green Design Award 2010, in a contest by Allied Electronics. RoofMill™ Advance Home Energy System, it’s a grid tied home wind turbine generator together with rooftop solar panels in a complete “Whole House” system. It has emergency UPS for your home and can run your meter backwards selling unused power. ONLY FROM: WindEnergy7-Com – WindEnergy7 LLC, The Home Wind Turbine manufacturer, located in Ohio, has an opportunity for people who buy a home energy system to become the local dealer for home wind turbines. We are one of the few places where green jobs are actually being created. 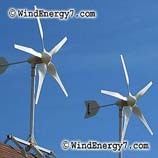 WindEnergy7.com – A US manufacturer of home wind turbine kits. Our patented home wind turbine rooftop kit is currently available for purchase online. Or buy a home wind turbine from our established nationwide wind turbine dealer and wind turbine installer network. Our home wind turbine is a very high tech, quality engineered, rooftop wind turbine kit, invented and patented by WindEnergy7 LLC, an Ohio manufacturer. The home wind turbine has a 2 moving part generator using the strongest magnets in the world, less moving parts than any other competitor. Less moving parts in a home wind turbine means less wear, less noise and vibration making the home wind turbine quiet on your home’s roof. Our home wind turbine will run smoothly and spin your meter backwards. We have more installed rooftop home wind generators than anyone because we have solved the noise and vibration that is the problem of all other systems out there who try to put home wind turbines on a rooftop. 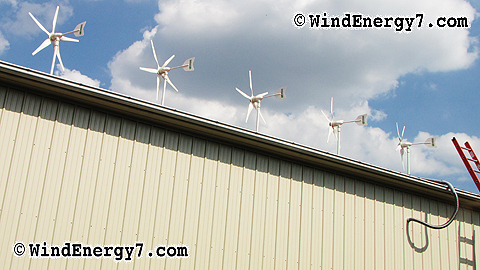 WindEnergy7.com – An Ohio manufacturer of home wind turbine kits. Our patented small wind turbine rooftop kit is currently available for purchase online. Or buy a small wind turbine from our established nationwide wind turbine dealer and wind turbine installer network. Our small wind turbine is a very high tech, quality engineered, roof mounted wind turbine kit, invented and patented by WindEnergy7 LLC, an Ohio manufacturer. Less moving parts in a small wind turbine means less wear, less noise and vibration making the small wind turbine quiet on your home’s roof. Our small wind turbine will run smoothly and spin your meter backwards. We have more installed rooftop small wind turbines than anyone because we have solved the noise and vibration that is the problem of all other systems out there who try to put small wind turbines on a rooftop. These systems are ONLY AVAILABLE from WindEnergy7-Com or one of their local dealers. For more information, or to become a customer, dealer, or installer, go to the site at WindEnergy7.com and fill out their Contact form to find out about becoming a wind turbine customer, installer, or wind turbine dealer in your local community.